A candle can be a really magical thing. It brings lightness to the dark. 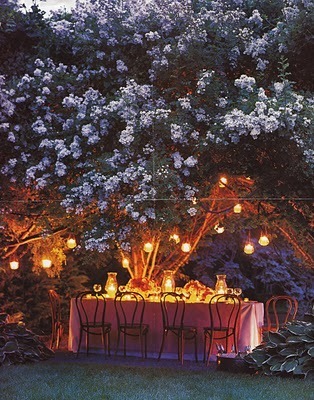 Gives a wonderful, ambient glow to the surrounds. Creates a mood. Provides a boost to the moment it is lit for. Is symbolic. Is illuminating. It also provides the perfect finishing touch to a dinner party. Who could resist sitting at the table below?! 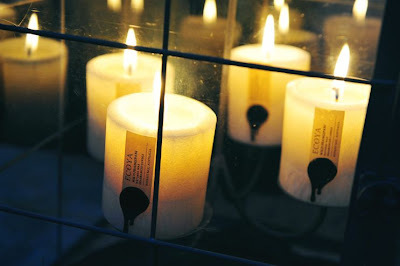 I worked for a couple of months at a magical Australian candle company Ecoya that make a beautiful hand poured soy range. Gorgeous scents including Lotus Flower, Sweet Pea & Jasmin and Wild Frangipani are wonderful! Large and small pillars, candles in glass jars and small travel tins. It is a divine, deluxe range. Check them out if you can! I've been spending some time bring attention to what I am doing by lighting a candle while I am doing it. When I am sitting down to work on a project I've been lighting a vanilla scented candle to accompany me and give me some inspiration. When starting to clear up and do some decluttering in my room I lit a candle to symbolise the moment and infuse it with some uplifting energy. I find a candle helps when you want to bring some focus to the moment. It also helps me get over the line when I have to do something I'm really not wanting to do by making it into a more 'stylish' task. Grab some candles and make your time and space a more creative task and infuse it with some illuminating magic.